Page Rank of a blog is very important for every bloggers because it shows the domain authority. It also helps readers to get an idea about how popular a blog is which they are reading. There are many professional Blogger Tricks that you can use to increase your blog page rank. But basically Page rank depends on the number of quality backlinks and internal linking of blog posts. Internal linking plays a main role in increasing page rank and search engine crawl rate. They also help to increase our blog page views and reduce the bounce rate. We internally link our related posts and categories into our content. But in blogger there are labels in place of categories. If we internal link to a label page, then the link juice will be waste because labels link have no value. They only used to categories the posts according to proper label. If you ever checked your robots.txt file then you will definitely aware with the fact that by default the labels link are disallowed for search crawlers to index. You are much smarter to think if a link is blocked by search crawlers then what’s the benefit to use it for internal linking. To get rid of this issue today I come with a very solid trick that will help you to increase page rank of all of your blog posts. Let see how to achieve this goal. Suppose if you write a tutorial related to "Blogger Tricks" and want to link your "Blogger Tricks" label page so that readers can read all the articles. How To Create a Sitemap For a Particular label? If you follow above method of internal linking for category page then your all blog posts will gain strength and higher ranking in search results. 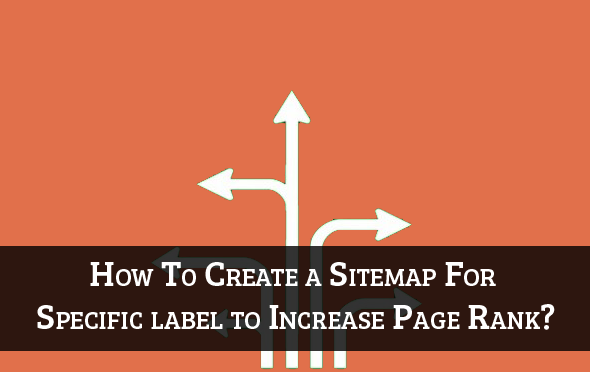 Now the question is how to create sitemap page for particular label. This is very simple to do. Navigate to Pages > New Page > Blank Page. Now paste below code in the post body. Replace www.example.com with your own blog URL and Your%20Label with label for which you want to create a page. Tip: If you have single word as your label page like “SEO” then replace Blogger%20Tricks with SEO but if you have more than one word in your label name then put %20 between them to separate them. The name is case sensitive. So, take care of it. Now click on Publish button. Now use that page URL whenever you need to link your category (label page). It will boost the page rank of all of your blog posts. Kindly give me your valuable feedback about this article. ;) Happy Blogging! This tutorial is shared by Ankit, who is a professional blogger and SEO consultant. He shared lot of SEO Tips for Bloggers on his blog www.BloggerTipsTricks.com. Thanx for sharing useful information. How can I show every title in blockquote or big font please help its looking simple not attractive. what if I want arrange contents in alphabetical order? Sorry, It's not possible in this widget. It'll show contents on published order. Later I was able to fix strange blog-page.html file name issue. Trick I used was to specify Page Title as first thing (before copying & pasting above HTML code) in blank page editor. Also, it seems that created html file name is automatically based on the text one enters in Page Title field. For example, when I entered "Hari-Om-Sharan-Bhajan-Lyrics-Hindi" as title, it created hari-om-sharan-bhajan-lyrics-hindi.html as file name. It shows up "Hari-Om-Sharan-Bhajan-Lyrics-Hindi" text in in my blog as link text. It seems that keeping page file name meaningful is important as search engines find page quickly if search key words are found in html file name itself. Hope others find this trick useful. I have been trying to find this for days, but couldn't quite explain to Google what I needed. THANK YOU!! Thanks for this Great post. Just i use this trick to my blog for Increasing my Page Rank. Hello chandeep ! can we add thumbnail of posts to sitemap ? Brother thanks for this post. I have a question, can I add number page navigation for this widget. my page is very lazy, Because my site have more then 120 posts. I've tried, creating sitemap for multiple categories and 20% had separated, still failed. but successful if only 1 category. Bro I have a problem. I want to add more labels one by one. I used Just copy and paste the ul..../ul tags. It's working fine. But When I add any heading to above each url's the page will be show just headings only. links never displayed. Your this trick would be work ...? I have a blog Jessie Harris but i can't apply your this trick. Maybe it will work in my own domain. Nice effort and thanks for give me valuable knowledge. HI this worked perfectly for my blog i created drop down menu using the link :) thank u so much. but as it shows only the post titles is it possible to show thumbnail and little discrption of the post along with title on sitemap page to make it look more attractive. How to add images to these plain urls to make it live.I means I want to add image snippet to this sitemap .What should I do ? Thank's for sharing brother. Your tutorial it work in my blog..